I have not included the factor new to this year, which is the surge in high cost generation not reported by the system operator (IESO) or the system planner (OPA). That will be left for another post, except to note generation, and demand figures for the first half of 2013 I estimate to be underreported by ~1.1TWh, roughly double the unreported amounts for 2011 which were double the amounts for 2009. Other than that, the trends apparent 2 years ago continue, and the excessive rate hikes of the past couple of months are due to the government's consistent disinterest in competently managing supply. Ontario's electricity sector experienced more of the same during the first half of the year - which continues to betray the ongoing mistakes of the government and the Ontario Power Authority (OPA). The headline figures for the first half the year, when June's numbers are finalized in a couple of weeks, should be anemic demand growth accompanied by inflation in pricing of almost exceeding 10%. But the same headlines should have been written one year years ago. Instead, Ontario's residents continue to be subjected to errant implications an insatiable appetite for ever more electricity is driving the price hikes. With supply mix issues in the forefront, including the demon wind and the sale/disposal of AECL this week, I thought I'd review what the supply mix actually was, in terms of production, over the first half of this, and past, years. The quick visuals show that the big growth stories (since 2004) have been nuclear, and natural gas - with coal the obvious target of reductions. The government has been fairly consistent in noting a desire for about 50% of the supply being provided by nuclear power. The supply mix I've shown is production, which includes electricity that gets exported. 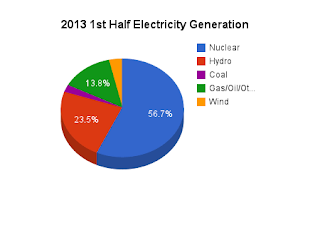 In the first half of 2011 2013, nuclear power generated about 42.5 43.1 TWh of electricity, and Ontario consumed about 70.2 69.5 TWh [IESO Ontario demand]- so nuclear production was over 60% of Ontario consumption. 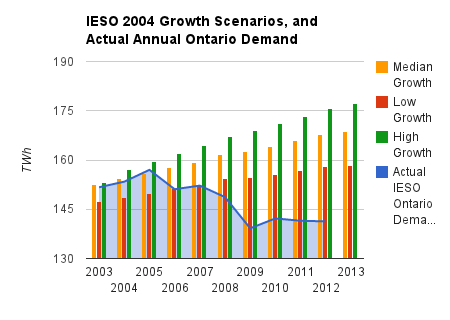 I am a strong supporter of nuclear, and I invite readers to view Donald Jones' Alternative Long-Term Energy Plan, but currently only 2 reactors at Bruce B are consistently used in demand response supply curtailment actions by the IESO. There is a flexibility issue with output from our current nuclear, and that is why the plans kept it at 50%. I'd prefer the flexibility issue was addressed (it has been at Bruce's reactors), but that's a separate issue. To understand how we got to the elevated share of nuclear, it's important to note the government's agencies' belief in what was going to happen with demand, and illustrate that against what did happen. 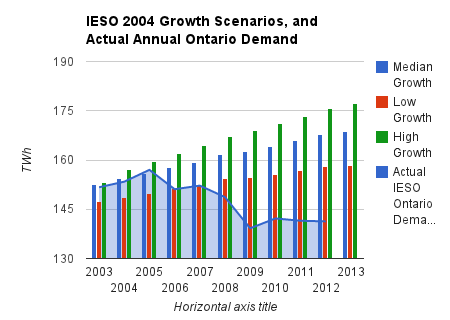 I would argue 2011 2013 is likely to come in below around 2010 levels, so we see that in 2004 forecasts were too high, just as they were in 1989, when Ontario Hydro prepared “Providing the Balance of Power”. That document should have provided a warning as it wrongly predicted annualized growth of 2.2% over the 25 years to 2014. 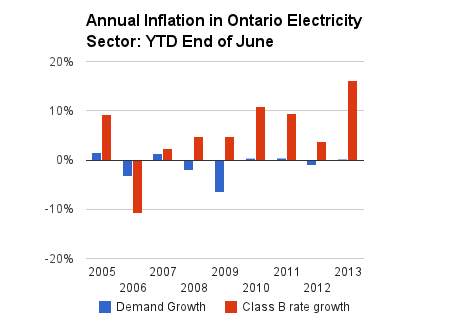 In 1989 Ontario's demand was 140.7 TWh, which is right about where we are heading in 2011 2013. The problem with the inability to accurately foresee the future is the planning for the future which fails to account for the possibility of error. We see this in numerous ways. One of those frequently noted on this blog is the desperate need to dump exports. 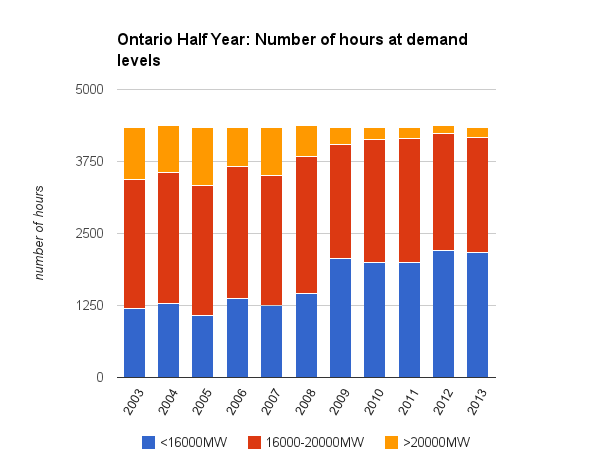 I noted yet another indicator of this trend the other day in looking at data changes since 2005 - the year of peak electricity demand in Ontario. 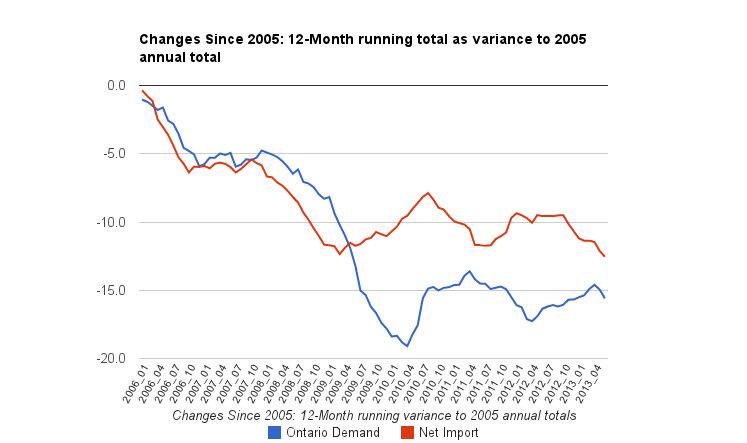 This graph shows 12-month running totals where the growth in exports (shown as negative imports) end up almost exactly matching the decline in Ontario demand over that time - so cuts in demand are not met with cuts in overall production, but through increased exports. 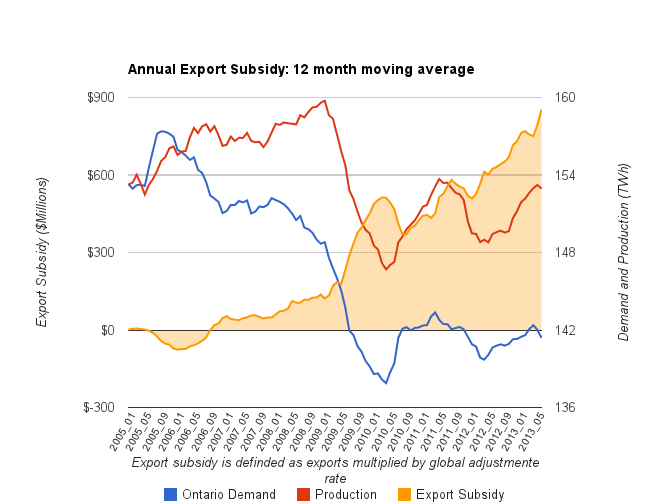 The problem with this need to export is it has come at a time when the price of electricity is very depressed not only in Ontario, but in our primary export markets, which also saw demand peak in 2005 (although their declines have been less severe). I've been tracking, again as 12-month running totals, the difference between what export markets pay for Ontario electricity, and what Ontario residents/businesses would pay for the same amount of electricity. I've defined that as a subsidy. One notable from the first half of 2011 2013 is this figure is at a new all-time high. There are 2 factors that have driven the estimated annual 'subsidy' back up above half a billion dollars. 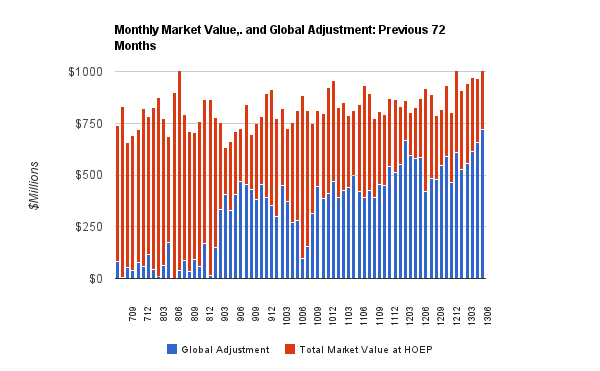 The volume is one, and the other is the amount of the global adjustment. Almost all Ontario supply is contracted (one reason it can't be easily cut), but the IESO does operate a market, and the market price has indicated supply gluts as the Hourly Ontario Energy Price (HOEP) has dropped. 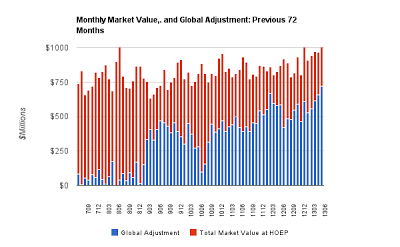 The difference between the contracted totals, and the totals recovered by the HOEP pricing, comprises the bulk of the amount charged back to the customers of Ontario's Wholesale Market as the Global Adjustment (GA) - so export customers pay only the HOEP, and Ontario customers pay the HOEP plus the Global Adjustment. 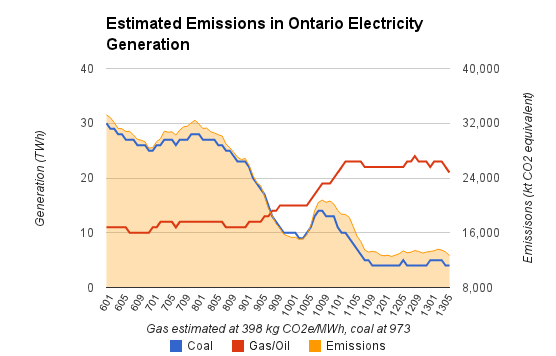 Reducing emissions has been the target of Ontario's electricity policies. Estimating emissions related to electricity generation, we see emissions have been reduced, and it does relate to the reduction of coal use. Again the figures are relative to the peak demand year of 2005, and the chart indicates the variance to that (earlier the same dataset showed the relationship between declining demand and growing exports). These are my own lame estimates using intensity figures cited by OSPE (Ontario Society of Professional Engineers), of only CO2e based on 0.85 0.973MT/MWh for Coal, and 0.5 .398 MT/MWh for gas. Unfortunately, this method matches up pretty well to falls short of the figures for Ontario emissions shown in Canada's latest GHG reporting. The reason for that is we We don't actually measure emissions at the source, despite the increasing body of evidence that more intermittent generation (wind and solar) increases the emissions intensity of the natural gas back-up systems. GE is now targeting the performance, as back-up to intermittent sources, in its latest natural gas turbine designs, while across the world natural gas lobby groups are targeting governments to provide 'capacity' payments as they sell a blend of wind and gas supply. 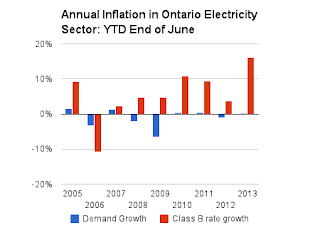 It is in the relationship of intermittent, or 'green', generation sources, and natural gas back-up supply, that we have received the large price increases in Ontario, even as we have seen demand crumbling. Ontario could be cited as a world leader for its contracts with the big 5 CCGT installations that became operational since 2007, all of which basically receive capacity payment. Earlier this year a leading US electricity executive declared his company “almost as dependent on natural gas prices for earnings and growth as a gas exploration company.” Shortly thereafter another former executive was noting depressed prices were a market signal that no new generation should be built, and that gave way to a big push for 'capacity' payments, or subsidies, by the natural gas industry in North America; a call now being echoed across the Atlantic. If other jurisdictions are duped, Ontario will prove to have been a world leader as it figured out how to pay over $100/MWh for natural gas generation while less enlightened jurisdictions paid less than half that amount. The other 'forward thinking' accomplishment of the first half of the year was the IESO's establishing methods to pay wind producers (and perhaps solar in the future) not to produce electricity. Because of the aggressive targets for adding wind - unneeded and unwanted - the IESO recognized we would increasingly have too much power, contracted by the inept OPA, and the threats to the grid required some action. In fact they required the opposite of action. They required the procurement of more supply to stop until there was a plan to avoid paying suppliers not to supply. One stat I omitted when first posting, that I think is extremely relevant, is the number of hours of 'high' demand is falling consistently since 2005's peak. From a supply mix point of view, quite frequently nuclear is providing over 10000MW, hydro is capable of over 5000MW much of the day, and gas should be able to deliver another 5000MW (including over 4000MW of CCGT supply built in the past 4 years). The law of declining returns is kicking in extra hard as the coal use we are attempting to avoid is necessary fewer, and fewer, and fewer, hours almost every year.